It's tempting to think that cameras always tell the truth, but they don't. Cameras are actually especially insidious because they give us the illusion of the truth when in fact they can distort reality in ways we don't expect. Different camera angles can make a person look tall or short, for example. The right lens can make a scene look really big or disproportionately small. And a lens can also change the shape of a person's face, depending on how close the photographer is to his or her subject. So what has all of this got to do with Melania Trump? A lot, if you have been paying attention to the "fake Melania Trump" rumors that are all over social media. Because in some of the photos we've seen of the first lady, she just doesn't look like herself. So how much of it is just camera angle and focal length, and how much of it is Melania hiding in a bathroom somewhere while a body double does first lady duties in her place, so she doesn't have to bother with going through the motions? Let's take a look. There doesn't seem to be any consensus on where exactly this theory first reared its ugly head. According to Esquire, it was probably a 2017 tweet from Joe Vargas, who is a CBD retailer operating under the business name "Buy Legal Meds." So not a huge Twitter figure, really, but for some reason this particular little tweet turned into a giant, out-of-control force of nature. "This is not Melania," he wrote. "To think they would go this far & try & make us think its her on TV is mind blowing. Makes me wonder what else is a lie"
He then posted side-by-side photographs of the first lady (or the alleged first lady, if you believe the accusation). In the first photo, Melania looks pretty much like Melania always looks — stern-faced and squinty-eyed. In the second photo, she's wearing a pair of huge sunglasses. Not super-convincing, but people love conspiracies, and it wasn't long before thousands of people were spreading the rumor online and people were going, "Yeah, sunglasses Melania kind of does look not very much like not-sunglasses Melania. Proof!" And so fake Melania was born. So why, oh why, would this dumb rumor keep popping up years after that first tweet? Well, apart from the fact that people just love conspiracies in general, this particular conspiracy seems to fit nicely with Melania's personality and the relationship she appears to have with her husband. 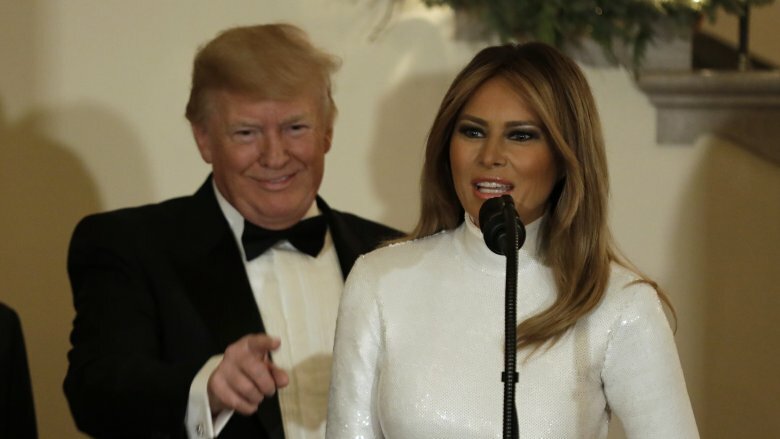 Esquire points out that the first lady famously avoids the press, sleeps in a separate bedroom from her husband, often refuses to hold his hand, and really does seem to be faking her way through a lot of those public events she's compelled to attend. 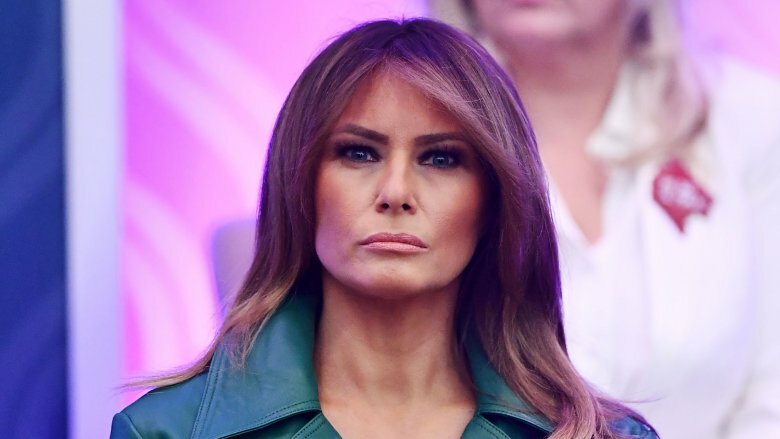 So it's really not a huge leap from there to think that she might have found some Melania lookalike or another so she doesn't have to actually pretend to like being the first lady (not that she does an awesome job of that anyway). There was also that time when she actually vanished for 24 days, which fueled all kinds of speculation about what she might have been doing. So perhaps to avoid similar future gossip, she decided to use a stand-in. It is true that Melania is one of the least visible first ladies the United States has ever had, but that doesn't necessarily mean she'd go so far as to hire someone else to walk in her ridiculously expensive high heels. Still, given a nice, comfortable pile of cash, a husband she actively dislikes, and duties she never really asked for or wanted, the thought must have at least crossed her mind. The rumor is based on a few images in particular that appear to show the first lady looking not very much like herself. The most famous piece of "evidence" is probably one particular side-by-side image of Melania with and without sunglasses. The real problem with this comparison is that sunglasses — especially the giant ones that the first lady is so fond of — tend to have a distorting effect on a person's face. They can make a long nose look shorter, and they can make a face look wider. So it's really not very useful to compare a photo of a person without sunglasses to a photo of a person with sunglasses. Although, purveyors of this theory argue, the face-obscuring nature of those giant sunglasses is precisely the reason why Melania's body double would choose to wear them. Another problem with the whole idea is that people tend to look different on television than they do in photographs, partly because the screen itself can have a distorting effect. According to Snopes, one favorite piece of footage that supposedly supports the fake Melania theory was recorded using a phone filming a television screen. In the footage, Melania's face looks sort of squished. But if you compare the phone footage to the actual original CNN video, the distortion disappears and Melania looks more like Melania. So really, not super compelling. Keep trying, folks. Donald Trump isn't exactly the most articulate person in the world, so it's kind of hard to read between the lines when you're listening to him speak. He has said some really strange things that seem to give some weight to the whole fake Melania thing, though. In September 2017, for example, the president was talking to first responders in Fort Myers, Florida, just after Hurricane Irma, when he said something really odd. "I just want to thank everybody," he said, "The first responders, on behalf of myself, our Vice President — Melania really wanted to be with us." But Melania was literally standing right next to him, so what the heck? Did he forget she was there? Or maybe he meant she made a huge effort to get there and he chose a weird way to say it. Then in October 2017, Insider says he made a similarly strange comment. While speaking to reporters, he said, "My wife, Melania, who happens to be right here, finds this subject to be of such vital importance." Which of course led people to speculate that she was not actually "right here" because otherwise why would he feel compelled to say so? Still, is it really evidence that Melania is using a body double, or is it more likely evidence that the president is in his 70s and maybe getting a little grandpa-ish? Remember what Sherlock Holmes said: "Once you eliminate the impossible, whatever remains, no matter how obvious, must be the truth." Or something like that. We're not sure. The theory really hit the mainstream when The View decided to take it on. 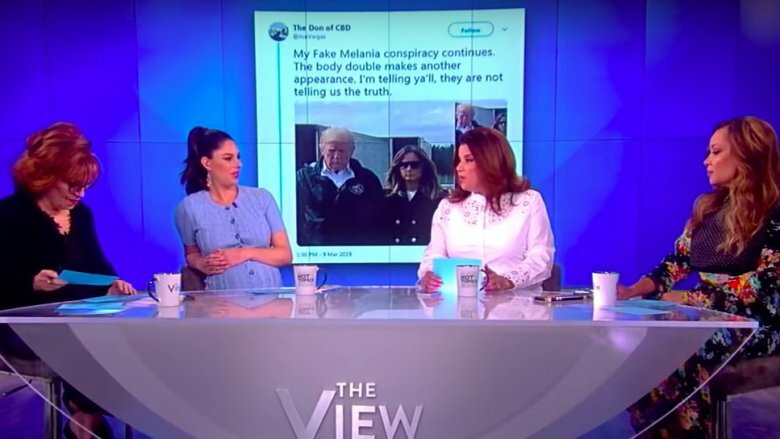 At first, hosts Joy Behar and Abby Huntsman said they were skeptical, but after looking at some of the photos of the Trumps surveying tornado damage in Alabama, Behar decided the person standing next to Trump had a "different-shaped face" than Melania. According to the Mercury news, Sunny Hostin then implied that she felt like the theory was credible enough to devote an entire hour of her weekend to, during which time she compared Alabama Melania to Other-Places Melania and concluded that Alabama Melania seemed shorter than Other-Places Melania. (The hosts did at least acknowledge that all footwear is not created with the same size heels.) Then guest host Ana Navarro made light of the whole issue by saying that it was "crazy and absurd — but it's also funny." And the conspiracy theorists went even wilder. What about that Secret Service woman who sort of looks like Melania? So if Melania does indeed have a body double, then who is it? Hey, what about that Secret Service woman who has the same color hair but otherwise really doesn't resemble the first lady all that much? Well, as it turns out if you spend enough time trying to convince the public that something's true, a good chunk of the public will just come around to believing you no matter how silly the thing you're saying actually is. 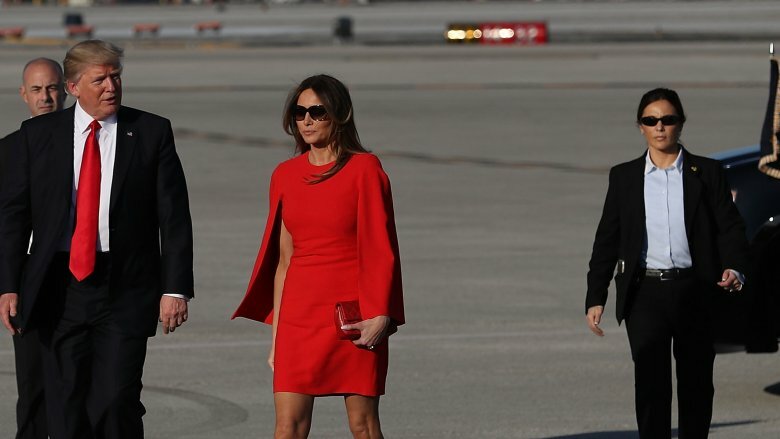 According to Insider, the Secret Service agent in question is sort of the same height as Melania, although in photos she looks to be several inches shorter than the first lady, give or take a couple inches of heel. Also, says Insider (cue the dramatic conspiratorial music), the agent "often wears sunglasses." Which, okay, we were following you there for a second but seriously? There are millions of people in America who wear sunglasses. Are they all fake Melania? Anyway we're sure that Melania's Secret Service agent just loves that half of Twitter thinks she's fake Melania and has probably not spent any time asking her superiors if she could just please go look after the Obamas for a while instead. But keep on conspiracy-ing, Twitter. It's a great look. So instead of just not paying attention to all the nonsense, President Trump himself decided to give fake Melania even more credibility by accusing the media of doctoring photos when that's clearly not what's going on. Those words, of course, were tweeted with absolutely no sense of irony from the guy who spent years promoting a conspiracy theory about President Obama's birthplace, but never mind. According to Vox, there's no evidence that anyone in the media or elsewhere has ever done any fake Melania Photoshopping. That sort of thing is actually pretty easy to spot, and totally unnecessary for the promotion of this kind of theory. Just about everyone has a photo or two where they don't really look like themselves, and that's largely due to those differences in camera angles angles and lens length, and also giant face-distorting sunglasses. But most of us never get accused of having a body double over a few odd-looking photos because most of us are not first ladies. 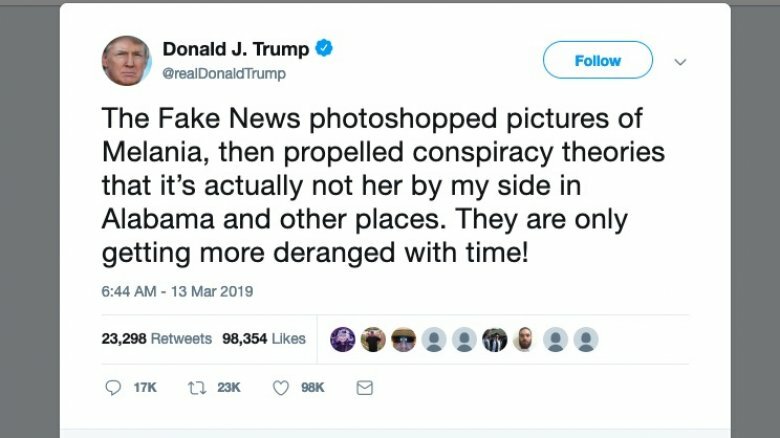 So in the absence of evidence that the "fake Melania" photos have been doctored, Trump is kind of making the whole thing seem more credible by accusing the media of things it's clearly not doing. Gotta fill those tweets with something! Melania Trump wears heels. She doesn't just wear heels, though, she wears these crazy stiletto freaking things that could double as zombie killers in the event of an actual apocalypse, which maybe explains why she wears them to disaster zones like she did after Hurricane Harvey in 2017. You know, just in case. So she's several inches shorter than she often looks. Anyway, according to Esquire, after Hurricane Harvey, people were mercilessly critical of the first lady for her choice of footwear, and for some reason she decided to not point out the very real possibility of zombies rising from the flood waters, which would have at least shown the world that she's not only resourceful but also has a sense of humor. She didn't, though, instead she just silently and without comment traded the heels for a pair of sneakers on her trip to the disaster site in Alabama. And that made her seem shorter, which of course made people scream "See! Fake Melania!" In reality, though, you have to give the first lady credit, at least for the fact that she was daring enough to be seen wearing common-people shoes in public. Bold. So, it basically went down like this. Someone said something on Twitter, and Twitter went "It's true!!" And now fake Melania is a thing because that's what happens whenever anyone says anything dumb on Twitter. Twitter seized on the idea and ran with it and #fakemelania was even trending for a while. "'My wife Melania who happens to be right here' is exactly what someone whose wife Melania happens to *not* be right here would say," noted one Twitter user. Another one seemed to be implying that Melania not only had a double but that the double was a robot. But many of the tweets were lighthearted and most users didn't seem to think that there was any real meat to the rumor. 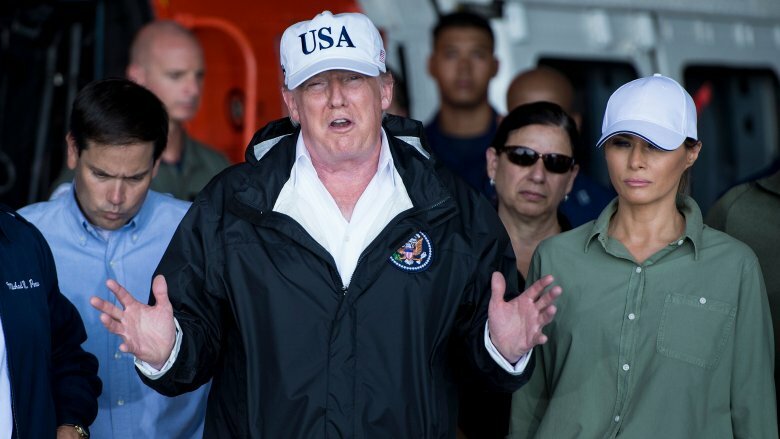 "Can we drop this #fakemelania stuff now, folks," said another user. "@realDonaldTrump might notice Melania has hired a body double so she doesn't have to be around him much." 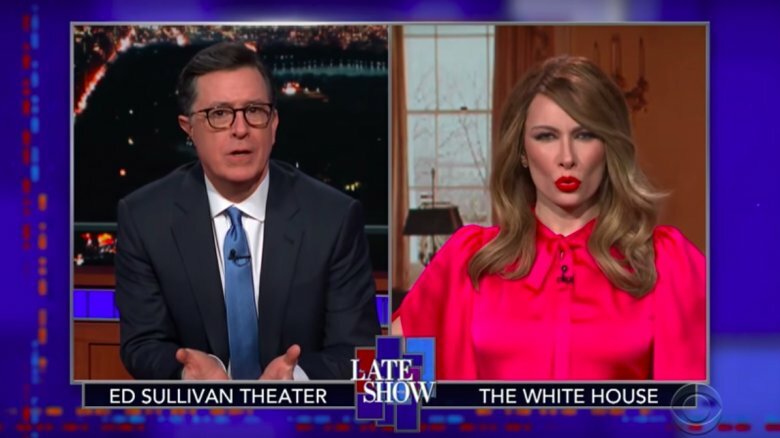 It wasn't just Twitter, though, the whole dumb theory made headlines and was even given some time on the Late Show with Stephen Colbert, which had its own fake Melania Trump denying there was such a thing as a fake Melania Trump. So really, you can't blame everyone for having fun with the idea. At least we're not all obsessing over trivial stuff, like health care and climate change, right? Ironically, the fake Melania story is actually so fake that the "fake news media" has even come out and said the story is fake, which does actually kind of make you wonder, if the fake news media says fake Melania Trump is fake, and the fake news media is fake, does that mean that fake Melania Trump is not fake? It kind of makes you think, right? Anyway, even CNN ran an article about fake Melania Trump, which was in no-uncertain terms entitled, "No, Melania Trump does not have a body double." Their story really doesn't seem likely to dissuade those who are especially passionate about the idea, though, since the bulk of the information in the article seems to have come directly from the White House itself, and why would the White House admit fake Melania Trump is fake if they're counting on the public believing that fake Melania Trump is totally not fake? "Once again, we find ourselves consumed with a ridiculous non-story when we could be talking about the work the first lady is doing on behalf of children, including the opioid crisis that is gripping our nation," a White House spokeswoman said in a statement to CNN. 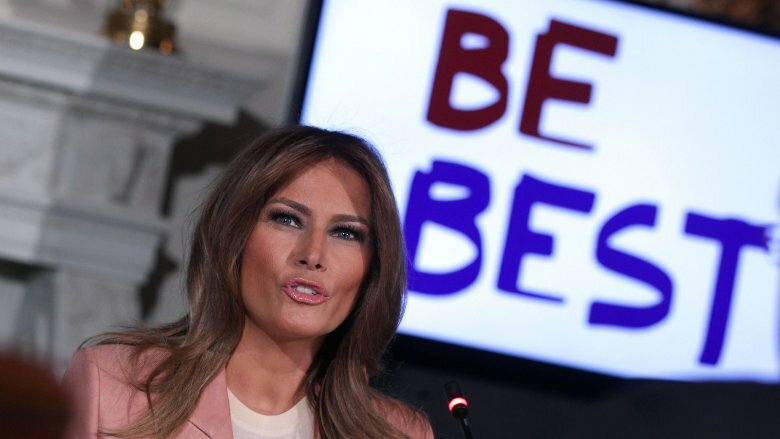 So in other words, people, just forget fake Melania and Be Best. The world will be a better place. It's not true. Sorry but it's just not. Fake Melania is fun and the Twitter comments and late-night sketches are great and cathartic, but at the end of it all there really just isn't any compelling evidence to support the idea that the first lady uses a body double. According to Esquire, the one thing that most of those fake Melania discussions leave out of the equation is all the other photos that are taken on the same day as the conspiracy-supporting photos, that show the first lady wearing the exact same clothes and standing in the exact same places, in which she very clearly looks like Melania Trump and not like a shorter Secret Service agent version of herself. So is it all just harmless fun or is it just as bad as all the other dumb conspiracy theories that have been circulating the globe since the beginning of time? It certainly is a lot more entertaining than the fake Moon landing conspiracy or the "who really shot JFK?" one. 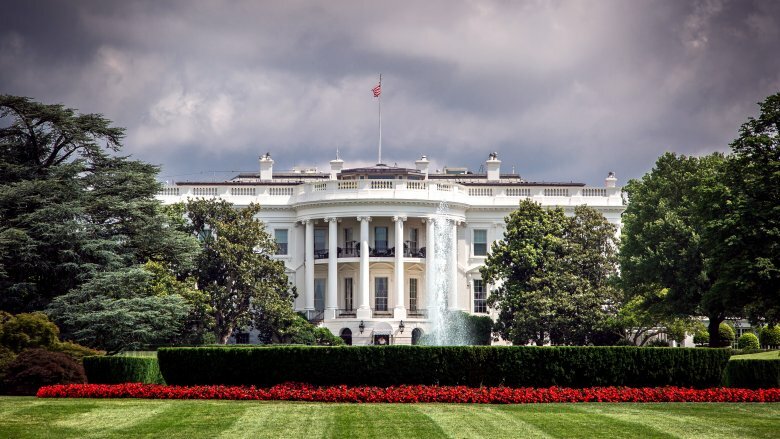 It also seems to bug the heck out of the White House, which is probably one of the reasons why so many people are still gleefully talking about it. And if it gets our collective minds off health care and climate change and the fact that no one in America gets along and the whole world is basically going to heck, well, bring it on. Maybe it will help us all Be Best, at least indirectly.